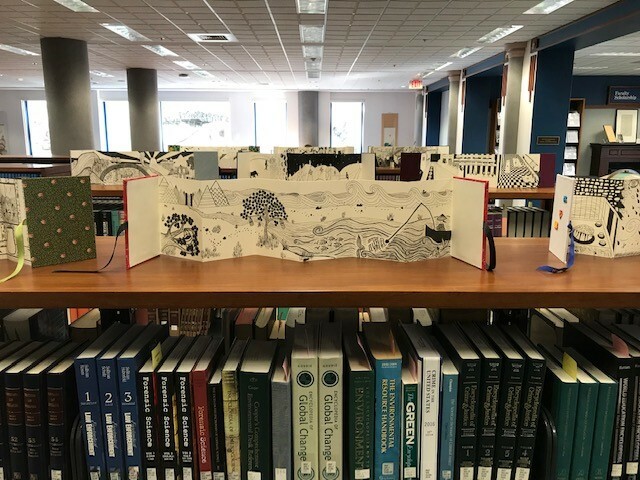 Visit the library to view the accordian book display from Professor Kristi Arnold's Art 204 CE, Fundamentals of Color and Design class! Gestalt Theory/Psychology is a theory that visual information is identified all-at-once, holistically, before it is examined as individual parts. The 6 different aspects of Gestalt Theory as seen in art are as follows: Grouping, Containment, Repetition, Proximity, Continuity, and Closure. From a list of artists, students chose an art-historically relevant, .2-dimensional artist to research. Students drew upon the selected artist's work to derive inspiration in regards to style and subject matter while incorporating Gestalt Theory. Some of the artists chosen for the project are Katsushika Hokusai (1760-1849) a Japanese woodblock printmaker most notably known for his prints of Mount Fuji and natural landscapes, English painter, David Hockney (1937-), known for his colorful landscape paintings, American painter, Alex Katz (1927-), a figurative painter with a distinctive flat style, and Wayne Thiebaud (1920-), also an American painter that often depicts colorful items from consumer culture such as pastries and ice-cream cones.